Bath Town Hall is located at 271 Wilkes Street, Berkeley Springs, WV 25411; phone: 304-258-4926. Photo: Samuel Taylor Suit Cottage (a.k.a. Berkeley Castle) ca. 1888, overlooking the town from the hills about 1 mile above. Listed on the National Register of Historic Places in 2008. Jeanne Mozier, photographer, 2006, en.wikipedia.org, accessed April, 2012. Long before Morgan County was established, the town that would become its seat had gained considerable fame. Many came to "take the waters" for a cure, others came more to see and be seen, and most simply for diversion. 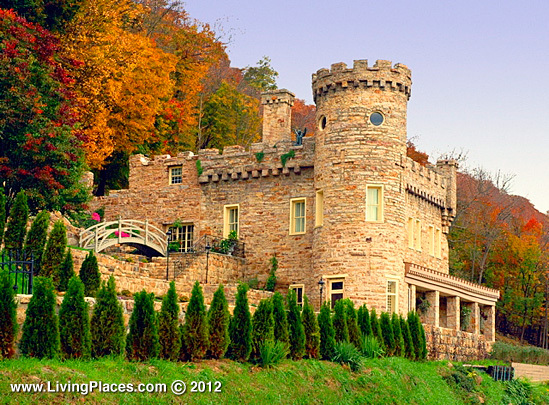 Berkeley Springs became one of America's oldest resorts. The earliest settlement was known by a variety of names, including Bath, Bath Town, Berkeley Springs, Warm Springs, and Frederick Springs. The village that grew up here in the mid-eighteenth century was most widely known as Warm Springs, but the Virginia General Assembly officially established it as the town of Bath in 1776, naming it for the famous English spa of the same name. Bath remains its official name, although is it best known by its postal name, Berkeley Springs. Native Americans valued the springs that issued from the base of Warm Springs Ridge at the western edge of the historic district, and European colonials followed suit. The springs lay within the extensive Northern Neck Proprietary of Thomas, Sixth Lord Fairfax of Cameron (1693-1781). George Washington's elder half-brother, Lawrence (1718-1752) was married to Anne (1728-1761), a daughter of Colonel William Fairfax of Belvoir, a land agent and cousin of Lord Fairfax. In March 1748, while on a surveying trip in the employ of Lord Fairfax, George Washington, not yet a month past his sixteenth birthday, recorded in his diary that he had called to see y. Fam'd Warm Springs, suggesting that the fame of the place was well established even by that time. Washington's first visit was only a day's duration, but he returned a number of times for longer visits over the ensuing decades. In 1769, Martha Washington's daughter, Martha "Patsy" Custis was brought to the springs in hopes of curing what may have been epilepsy. "It was hoped that a sojourn at the medicinal springs would prove of benefit to her. The three, Washington, his wife, and Patsy Custis, traveled in the family chariot." Evidently, the community's medicinal value was of little long-term help, since Patsy Custis died in 1773 at about the age of 17. Along with George Washington, Samuel and John Augustine Washington also owned property in Bath. Samuel Washington's Will was probated in 1781 and left his brother, John, "two lots in Bath town purchased of the commissioners, together with their appurtenances." John Augustine Washington's Will, written in 1784 and probated in 1787, included two Berkeley Springs lots as part of his estate as well. In an auction of all town lots in August, 1777, George Washington acquired two lots at the southeast corner of Fairfax and Mercer streets, two blocks from the springs. Because of his military and political commitments, Washington had little time to devote to building in Bath in the late 1770s and early 1780s, but other property owners did. At last, in September 1784, Washington was ready and able to build. On a visit to Bath that month, he obtained a town plat, "ascertained the situation of [his] lots therein," and sketched plans for a "dwelling house, Kitchen and Stable." He also contracted with James Rumsey, a jack-of-all-trades, to build them. Washington obviously intended something far more elegant than the required twelve-foot-square dwelling. His lengthy and detailed specifications, which he transcribed in his diary on September 6, 1784, called for a house "36 feet by 24, with a gallery of 7 feet on each side." Contemporary documentation of Rumsey's role is lacking, but some reports maintain that he promised to have the work "finished by the 10th of next July." David Taylor, Taylor & Taylor Associates, Town of Bath Historic District, Morgan County, WV, nomination document, 2008, National Park Service, National Register of Historic Places, Washington, D.C.